Photos taken by Joely Pope, a graduate student in the dual MPA/MAAA program at SPEA. During the academic year Joely is a Graduate Assistant with IU Theatre. She has been in Bloomington the last 5 years and has had the opportunity to work for some great organizations like Girls Inc. and the Monroe County YMCA. She has a passion for Superheros, dogs, and getting caught in the rain. Joely is the official, unofficial MAAA photographer. She is currently interning with the Children’s Museum of Indianapolis and the Indiana Arts Commission. 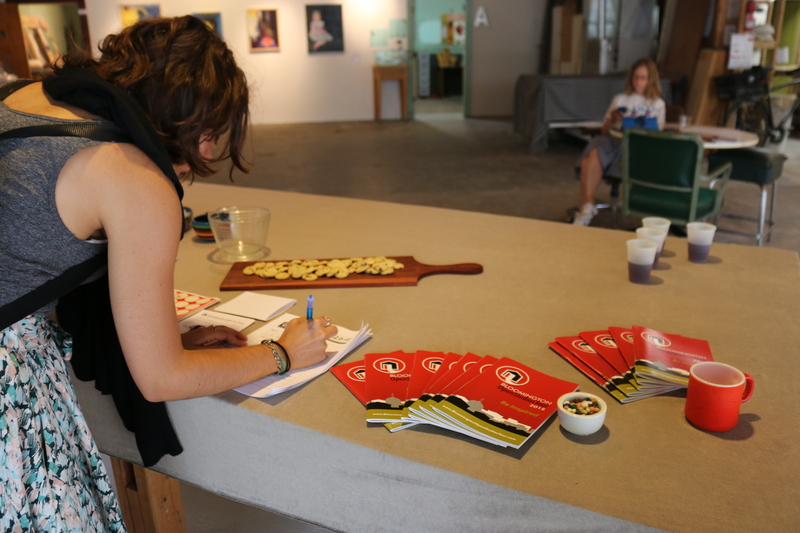 The first weekend of June, artists around Bloomington opened their studios and workshops to the public for the fourth annual Bloomington Open Studios Tour (BOST)! The tour is an artist-run initiative meant to engage the community in local visual art practices. 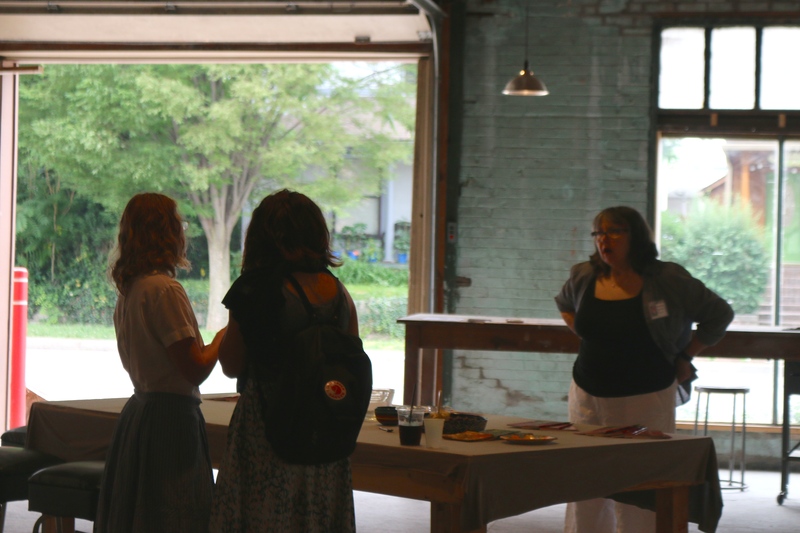 Attendees had the opportunity to enter studios and workspaces of local artists and see their materials, tools, and works-in-progress—not to mention chat with the artists themselves about their craft. This unique event celebrates connectivity between artist and community, which is a theme we have discussed often throughout our first year of the MAAA program. At a time when the relevance of art to our daily lives is thrown into question, events like the BOST remind us that art-making and physical spaces of creativity are already woven into the fabric of our cities and communities. Feeling intrigued by the idea of a behind-the-scenes look into artist spaces, Joely (MPA/MAAA ’16) and I decided to partake in BOST 2015. 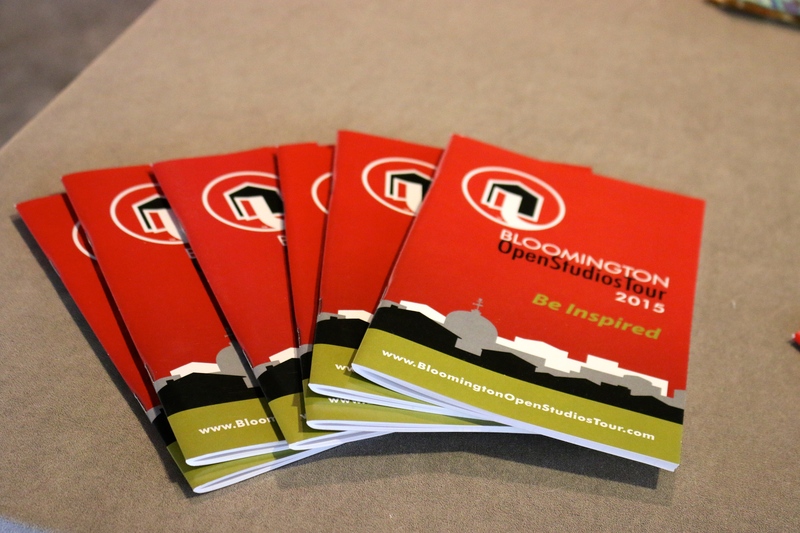 The downside first: we only got to 3 studios (out of 45 participating studios/artists…yikes! )….the upside: we learned a TON at the ones we attended. For this article we’ll focus in on two in particular: the I. Fell Building Studios and Gather. 2) …the I. Fell Building is fantastic!! I. Fell is a multipurpose community arts space looking to connect with the wider Bloomington community. BOST guides: these had info about each artist participating plus maps of all the studio locations. Also included suggested routes for seeing clusters of studios. Angela discussed the current state of the I. Fell: the building, located on 4th and Rogers in downtown Bloomington, has been reimagined into a unique community space that houses working artists’ studios, a clay studio offering public classes, a bookbinding studio and shop, a small local press, and a vegan bakery/coffee-shop. The artist studios are distinct rooms located around a large airy gallery space reminiscent of a warehouse. 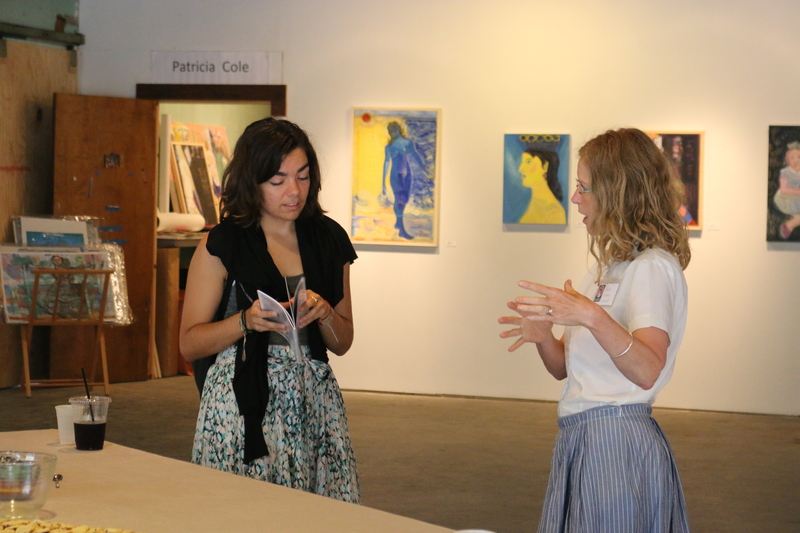 When we visited, the gallery walls were host to a sampling of BOST artists’ work and directors to visit their studios. We learned that the I. Fell tenants, along with their Board, envision a future where the building plays a larger role in the Bloomington community. They currently host First Fridays at the Fell, mounting different exhibits each month for Bloomington’s Gallery Walk festivities that occur the first Friday of each month. As Angela described it, the next step for I. 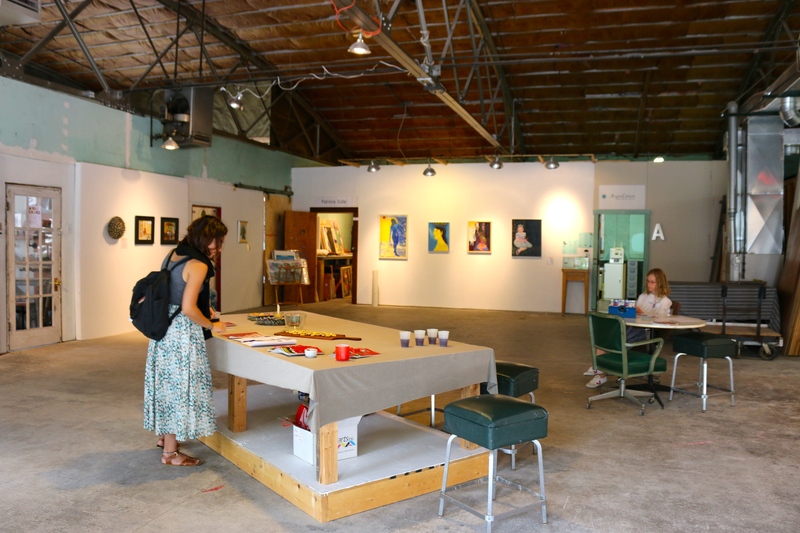 Fell is to expand their connections with community members and groups that are interested in renting their unique gallery space for events, anything from mounting an exhibit and accompanying opening reception, hosting a literary event like readings or poetry slams, teaching art workshops, performing arts events…etc. This was intriguing to Joely and I…the gears really started turning as we imagined various events our cohort could host in this awesome space in the coming year. 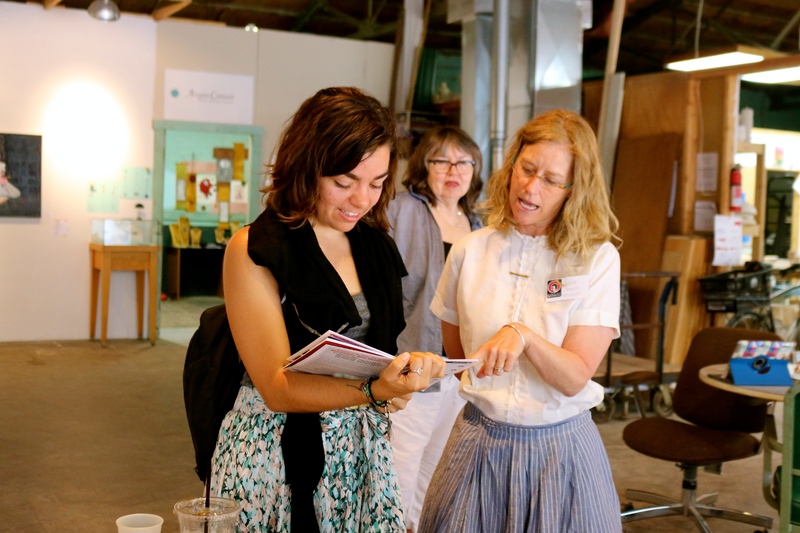 After learning about the building, we visited Angela and Patricia’s studio spaces. 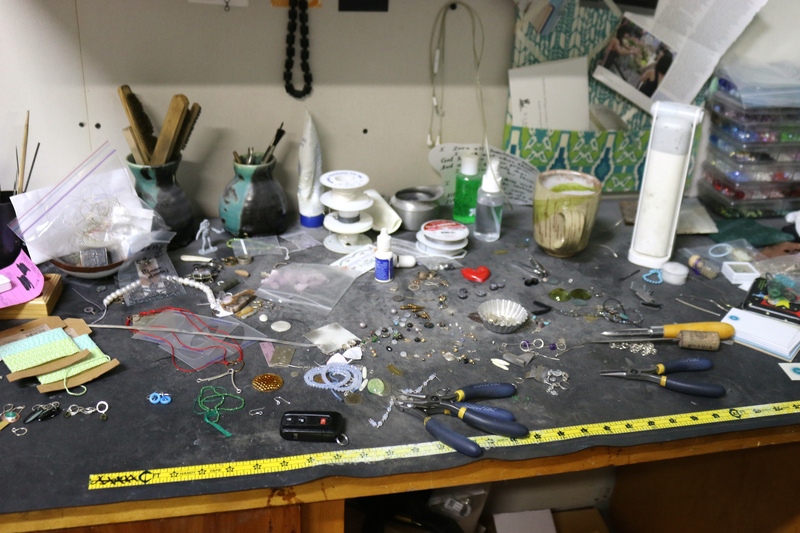 Angela’s space is full of shining baubles, beads, different strings and chains, and many tools. We saw finished pieces, pieces in progress, and the many materials of her craft. 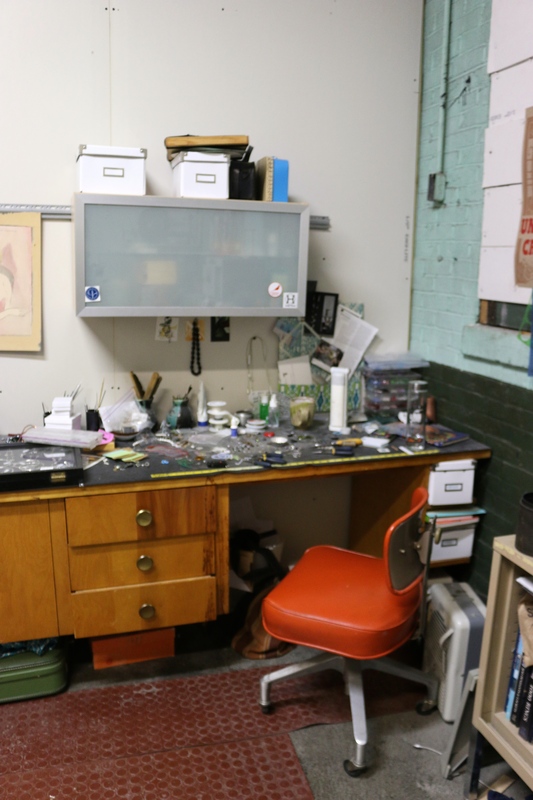 She rents part of her studio to a student who does metal-work and so they work communally. The space was certainly large enough to support two working artists, their work tables, and their storage units, but small enough to feel very intimate and special—and highly unique to the artists. Patricia’s studio was full of canvases, paints and paintbrushes, finished works and works in progress. She rents her space solo and has been working from the I. Fell for several years. She told us she spends most weekdays in her studio. Another view of Patricia’s studio. After chatting further with Angela and Patricia and checking out almost every nook and cranny of the gallery space and their studios…we decided to move on to our next BOST destination: Gather! 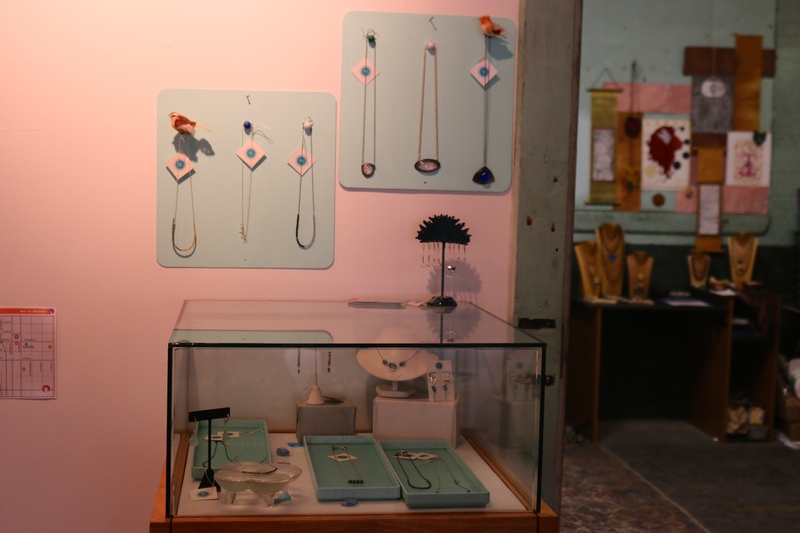 Gather is one part local arts and crafts shop, one part gallery, and one part workshop space—not to mention, owner/artist Talia Halliday’s personal studio is tucked in the back! Located in the Fountain Square Mall in downtown Bloomington, Gather is the first space of its kind in this community. We chatted with Talia about her experiences as an entrepreneur, artist, and community arts advocate. We learned that she started Gather as a pop-up shop and after seeing the overwhelmingly positive community response, realized a brick and mortar version of the store was feasible. She set up shop in the mall in August 2014. Visit Bloomington had set up this station to get BOST participant feedback! The shop is full of unique handmade items from soaps and balms to quirky prints of all themes and sizes to cards, jewelry, pins, clay work, clothing…and even a section for children! 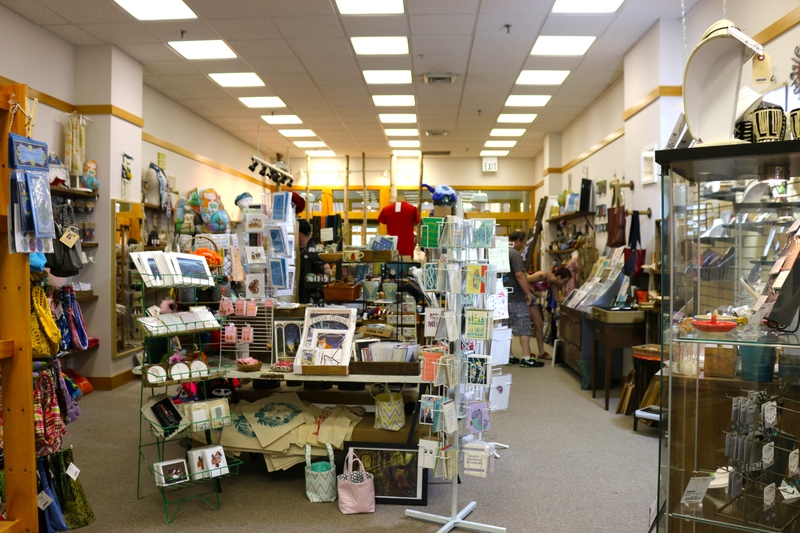 The back portion of the store is part Talia’s studio, part workshop space for the many craft classes Gather hosts. 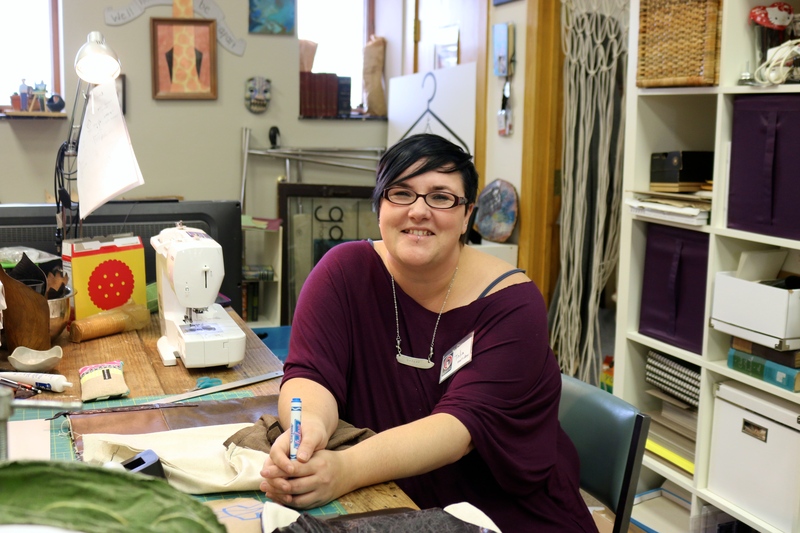 In addition to her work with Gather, Talia is an active member of the local maker community through her role as Co-Organizer of the Bloomington Handmade Market. 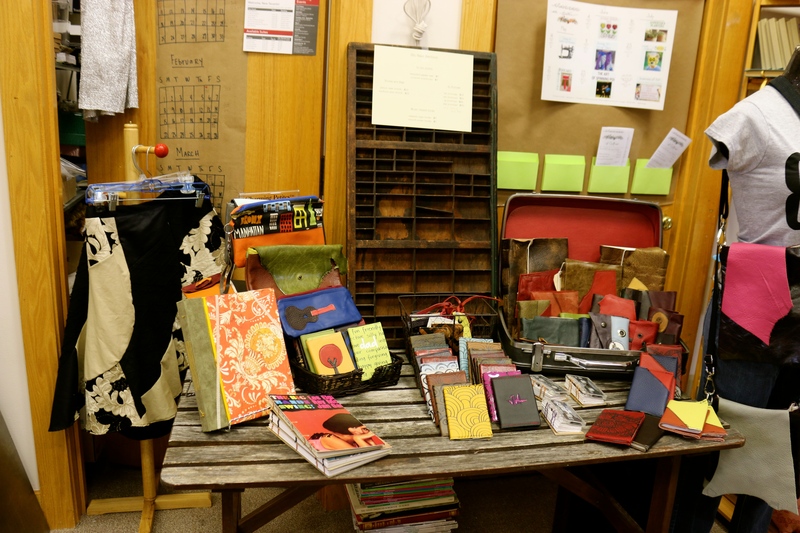 She began by selling her wares (handmade book art and leather goods—did we mention she also has her own company?) in the market and is now helping to run the show! 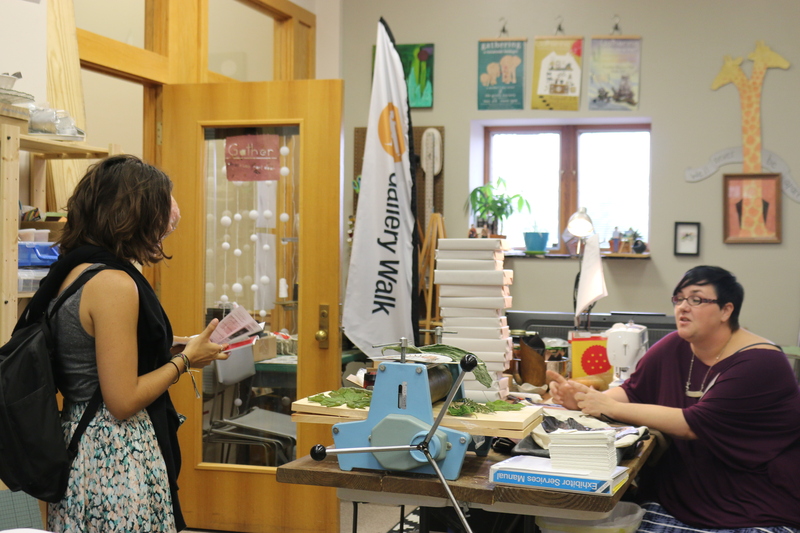 Our ultimate takeaway from chatting with Talia, Angela and Patricia at the Bloomington Open Studios Tour was the following: the entrepreneurial spirit is alive and well in Bloomington’s arts community! From I. Fell’s ambition to become a dynamic community space for artists/performers/writers/whomever to Gather’s role as a hub for local artists and makers to sell their wares and teach their craft, we are inspired by the arts entrepreneurship in this community. Chatting with these artists made us think of our discussions in Dr. Rushton’s course regarding the meaning of “entrepreneurship” in the arts realm, as well as the guest lecture on arts incubators by ASU’s Linda Essig which our cohort was fortunate to be part of. Entrepreneurship is a term that gets thrown around willy-nilly, but is grounded most simply in the concept of finding novel opportunities for creating value…then making them happen. Both Gather and I. 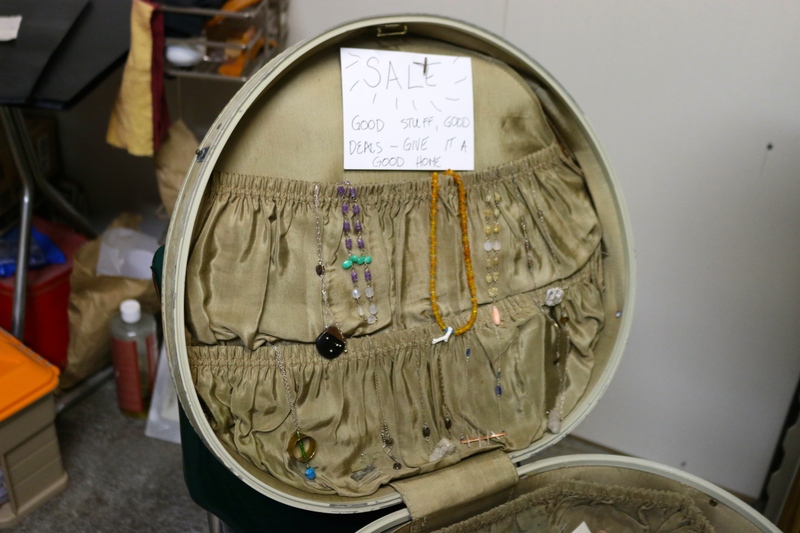 Fell have found new ways (starting the first handmade items shop, becoming a rentable, collaborative, multipurpose art space) to address common needs in the arts community (need a place to sell, need exposure, etc.). 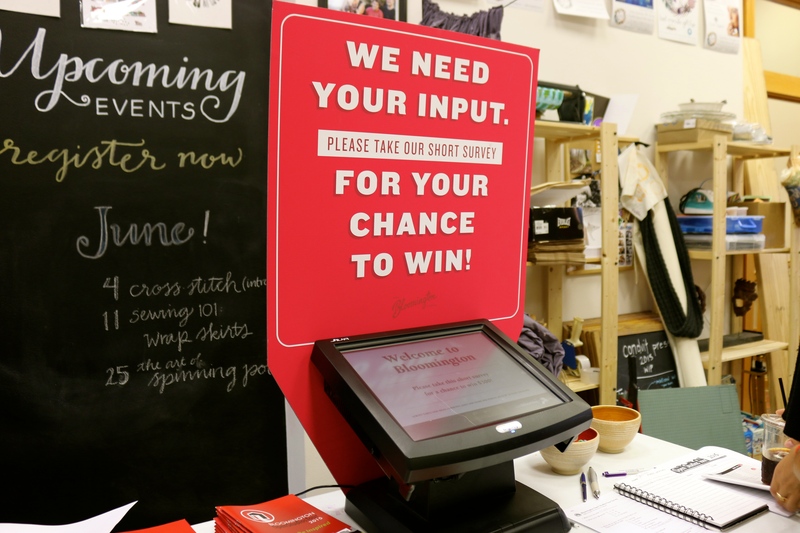 The outcome is that these organizations not only help artists and makers but enrich Bloomington community members’ lives as they get the chance to attend classes and events at these spaces, chat with local artists, and engage with the arts in ever-evolving ways!